Polk nominated both George W. Woodward of Pennsylvania and Levi Woodbury of New Hampshire in December 1845. Woodbury was confirmed, but Woodward was rejected by the Senate in 1846. Woodward’s nomination was defeated in large part due to the opposition of Buchanan and Pennsylvania Senator Simon Cameron. Polk subsequently nominated Robert Cooper Grier of Pennsylvania, and Grier won confirmation. Woodbury died in 1851, but Grier served until 1870 and notably joined with the majority decision in Dred Scott v. Sandford. Polk strongly supported expansion, and relations with Mexico and Great Britain, the country’s southern and northern neighbors respectively, dominated Polk’s presidency. Polk, like many other Democrats, fervently believed in the idea of Manifest Destiny, and he sought to create a bicoastal nation. Polk was successful in pursuing this goal, as his presidency saw the partition of Oregon Country with Britain, the annexation of Texas, and the acquisition of vast amounts of land from Mexico. Since the signing of the Treaty of 1818, the Oregon Country had been under the joint occupation and control of the United Kingdom and the United States. Previous U.S. administrations had offered to divide the region along the 49th parallel, which was not acceptable to Britain, as they had commercial interests along the Columbia River. Britain’s preferred partition was unacceptable to Polk, as it would have awarded the Puget Sound and all lands North of the Columbia River to Britain.Edward Everett, President Tyler’s ambassador to Great Britain, had proposed a new solution that would divide most of the territory at the 49th parallel but grant the strategic Vancouver Island to the British, but Tyler’s term ended before negotiations could proceed. Though both sides sought an acceptable compromise, each also saw the territory as an important geopolitical asset that would play a large part in determining the dominant power in North America. On taking office, Polk announced that he viewed the American claim to the land as “clear and unquestionable,” provoking threats of war from British leaders should Polk attempt to take control of the entire territory. Despite Polk’s hawkish rhetoric and desire to annex the entire territory, he viewed war with the British as unwise and unnecessary, and Polk and Buchanan opened up negotiations with the British. Like his predecessors, Polk again proposed a division along the 49th parallel, which was immediately rejected by the British ambassador, Richard Pakenham. Secretary of State Buchanan was wary of a two-front war with both Mexico and Britain, but Polk was willing to risk war with both countries in pursuit of a favorable settlement. As 1845 came to an end, Polk began preparations to give Britain a one-year notice (as required in the Treaty of 1818) of his intention to terminate the joint occupancy of Oregon. When the British Foreign Secretary, Lord Aberdeen, learned of the proposal rejected by Pakenham, Aberdeen asked the United States to re-open negotiations. After the brief collapse of British Prime Minister Robert Peel‘s second ministry, Peel and Aberdeen sought closer relations with the United States as part of a re-orientation towards free trade. In March 1846, Polk allowed Buchanan to inform Louis McLane, the American ambassador to Britain, that Polk’s administration would look favorably on a British proposal based around a division at the 49th parallel. In June 1846, Pakenham presented an offer to the Polk administration, calling for a boundary line at the 49th parallel, with the exception that Britain would retain all of Vancouver Island, and limited navigation rights for British subjects on the Columbia River. Polk and most of his Cabinet were prepared to accept the proposal, but Buchanan, in a surprising reversal, urged that the United States seek control of all of the Oregon Territory. After winning the reluctant approval of Buchanan and many of Polk’s Senate allies, Polk submitted the full treaty to the Senate for ratification. The Senate ratified the treaty in a 4114 vote. After years of negotiations, the United States and Great Britain had finally settled the Oregon question. Polk’s willingness to risk war with Britain had frightened many, but his tough negotiation tactics may have gained the United States concessions from the British (particularly regarding the Columbia River) that a more conciliatory president might not have won. The portion of the Oregon Territory acquired by the United States later formed the states of Washington, Oregon, and Idaho, and parts of the states of Montana and Wyoming. The borders established by the Oregon Treaty now constitute a portion of the CanadaUnited States border. The Republic of Texas had gained independence from Mexico following the Texas Revolution of 1836. Many Texians had migrated from the United States, and many Americans and Texians sought to make Texas a part of America following the Texas Revolution. Upon hearing of Polk’s election to office, President Tyler had urged Congress to pass a joint resolution admitting Texas to the Union, and Congress complied on February 28, 1845. Polk’s first major decision in office was whether to recall Tyler’s emissary to Texas who bore an offer of annexation based on that act of Congress. Though it was within Polk’s power to recall the messenger, he chose to allow the emissary to continue, with the hope that Texas would accept the offer. Polk also retained the United States Ambassador to Texas, Andrew Jackson Donelson, who sought to convince the Texan leaders to accept annexation under the terms proposed by the Tyler administration. Though public sentiment in Texas favored annexation, some Texas leaders disliked the strict terms for annexation, which offered little leeway for negotiation and gave public lands to the federal government. However, in July 1845, a convention in Austin, Texas ratified the annexation of Texas. In December 1845, Polk signed a resolution annexing Texas, and Texas became the 28th state in the union. The annexation of Texas would lead to increased tensions with Mexico, which had never recognized Texan independence. Perhaps the most important event of Polk’s presidency was the Mexican-American War. Though the United States had been the first country to recognize Mexico‘s independence following the Mexican War of Independence, relations between the two countries began to sour in the 1830s. In the 1830s and 1840s, the United States, like France and Britain, sought a reparations treaty with Mexico for various acts committed by Mexican citizens and authorities, including the seizure of American ships. Though the United States and Mexico had agreed to a joint board to settle the various claims prior to Polk’s presidency, many Americans accused the Mexican government of acting in bad faith. For its part, Mexico saw many Americans as desirous of the acquisition of Alta California and of filing specious or exaggerated claims. The already-troubled MexicoUnited States relations were further inflamed by the possibility of the annexation of Texas, as Mexico still viewed Texas as an integral part of Mexico. Additionally, Texas laid claim to all land North of the Rio Grande River, while Mexico argued that the more northern Nueces River was the proper Texan border. Though the United States had a population more than twice as numerous and an economy thirteen times greater than that of Mexico, Mexico was not prepared to give up its claim to Texas, even if it meant war. Following the Texan ratification of annexation in 1845, both Mexicans and Americans saw war as a likely possibility. Polk began preparations for a potential war with Mexico over Texas, and Polk sent an army led by General Zachary Taylor into Texas. Taylor and Commodore David Conner of the US Navy were both ordered to avoid provoking a war, while at the same time to prepare for war and respond to any Mexican breach of peace. Though Polk genuinely desired to avoid a war with Mexico, he more strongly desired the acquisition of Texas and Alta California. As in Texas, Mexico had failed to establish strong control over the sprawling expanse of California, and, as in Texas, many Americans had migrated to the region. Polk was particularly worried that the British or another European power would eventually establish control over California if it remained in Mexican hands. Polk hoped that a show of force by the U.S. military under Taylor and Conner could avert war and lead to negotiations with the Mexican government. In late 1845, Polk sent diplomat John Slidell to Mexico to purchase California for $2040 million. Slidell arrived in Mexico City in December 1845. Though Mexican President José Joaquín de Herrera was open to negotiations, Slidell’s ambassadorial credentials were refused by a Mexican council of government. In December 1845, Herrera’s government collapsed in large part due to his willingness to negotiate with the United States, as the possibility of the sale of large portions of Mexico aroused anger among both the Mexican elites and broader populace. Herrera was succeeded by General Mariano Paredes, and Mexico began to write a new constitution. As successful negotiations with the unstable Mexican government appeared unlikely, War Secretary Marcy ordered General Taylor to advance to the Rio Grande River. Polk began preparations to support a potential new government led by the exiled Mexican General Antonio López de Santa Anna with the hope that Santa Anna would sell parts of California. Polk had been advised by Alejandro Atocha, an associate of Santa Anna, that only the threat of war would allow the Mexican government the leeway to sell parts of Mexico. In March 1846, Slidell finally left Mexico after the government refused his demand to be formally received. Slidell returned to Washington in May 1846, and gave his opinion that negotiations with the Mexican government were unlikely to be successful. Polk regarded the treatment of his diplomat as an insult and an “ample cause of war”, and he prepared to ask Congress for a declaration of war. Meanwhile, in late March, General Taylor had reached the Rio Grande, and his army camped across the river from Matamoros, Tamaulipas. In April, after Mexican general Pedro de Ampudia demanded that Taylor return to the Nueces River, Taylor began a blockade of Matamoros. A skirmish on the northern side of the Rio Grande ended in the death or capture of dozens of American soldiers, and became known as the Thornton Affair. While the administration was in the process of asking for a declaration of war, Polk received word of the outbreak of hostilities on the Rio Grande. In a message to Congress, Polk explained his decision to send Taylor to the Rio Grande, and stated that Mexico had invaded American territory by crossing the river. Polk contended that a state of war already existed, and he asked Congress to grant him the power to bring the war to a close. Polk’s message was crafted to present the war as a just and necessary defense of the country against a neighbor that had long troubled the United States. In his message, Polk noted that Slidell had gone to Mexico to negotiate a recognition of the Texas annexation, but did not mention that he also sought the purchase of California. Some Whigs, such as Abraham Lincoln, challenged Polk’s version of events, but the House overwhelmingly approved of a resolution authorizing the president to call up fifty thousand volunteers. In the Senate, war opponents led by Calhoun also questioned Polk’s version of events. Nonetheless, the House resolution passed the Senate in a 402 vote, marking the beginning of the Mexican-American War. Many would-be opponents of the war feared that opposition would cost them politically by casting themselves as unpatriotic for not supporting the war effort. In May 1846, Taylor led the US in the inconclusive Battle of Palo Alto, the first major battle of the war. The next day, Taylor led the army to victory in the Battle of Resaca de la Palma, eliminating the possibility of a Mexican incursion into the United States. Meanwhile, Winfield Scott, the army’s lone major general at the outbreak of the war, was offered the position of top commander in the war. Polk, War Secretary Marcy, and Scott agreed on a strategy in which the US would capture northern Mexico and then pursue a favorable peace settlement. However, Polk and Scott experienced mutual distrust from the beginning of their relationship, in part due to Scott’s Whig affiliation and former rivalry with Andrew Jackson. Additionally, Polk sought to ensure that both Whigs and Democrats would serve in important positions in the war, and was offended when Scott suggested otherwise; Scott also angered Polk by opposing Polk’s effort to increase the number of generals. Having been alienated from Scott, Polk ordered Scott to remain in Washington, leaving Taylor in command of Mexican operations. Polk also ordered Commodore Conner to allow Santa Anna to return to Mexico from his exile, and sent an army expedition led by Stephen W. Kearny towards Santa Fe. In 1845, Polk, fearful of French or British intervention, had sent Lieutenant Archibald H. Gillespie to California with orders to foment a pro-American rebellion that could be used to justify annexation of the territory. After meeting with Gillespie, Army captain John C. Frémont led settlers in northern California to overthrow the Mexican garrison in Sonoma in what became known as the Bear Flag Revolt. In August 1846, American forces under Kearny captured Santa Fe, capital of the province of New Mexico. Kearny captured Santa Fe without firing a shot, after the Mexican Governor, Manuel Armijo, fled from the province. At roughly the same time that Kearny captured Santa Fe, Commodore Robert F. Stockton landed in Los Angeles and proclaimed the capture of California. After American forces put down a revolt, United States held effective control of two northern Mexican provinces. However, the Western theater of the war would prove to be a political headache for Polk, as a dispute between Frémont and Kearny led to a break between Polk and the powerful Missouri Senator (and father-in-law of Frémont), Thomas Hart Benton. At its outbreak, the war enjoyed support across the nation. However, Whig Congressman Columbus Delano accused Polk of engineering the war, and Whig resistance to the war spread. In August 1846, Polk asked Congress to appropriate $2 million as a down payment for the potential purchase of California. Polk’s request ignited opposition to the war, as Polk had never before made public his desire to annex parts of Mexico (aside from lands claimed by Texas). A freshman Democratic Congressman, David Wilmot of Pennsylvania, offered an amendment to the bill that would ban slavery in any newly acquired lands. The “Wilmot Proviso,” as it became known, injected the slavery debate into the Mexican-American War. The appropriation bill, with the Wilmot Proviso attached, passed the House in an 8764 vote, but the bill died in the Senate. Polk’s Democrats would pay a price for the resistance to the war and the growing issue of slavery, as Democrats lost control of the House in the 1846 elections. However, in early 1847, Polk was successful in passing a bill raising further regiments, and he also finally won approval for the money he wanted to use for the purchase of California. In July 1846, American envoy Alexander Slidell Mackenzie met with Santa Anna, offering terms in which the US would pay to acquire the San Francisco Bay and other parts of Alta California. Santa Anna returned to Mexico City in September 1846, declaring that he would fight against the Americans. With the duplicity of Santa Anna now clear, and with the Mexicans declining his peace offer, Polk ordered an American landing in Veracruz, the most important Mexican port on the Gulf of Mexico. In the September 1846 Battle of Monterrey, Taylor defeated a Mexican force led by Ampudia, but allowed Ampudia’s forces to withdraw, much to Polk’s consternation. Taylor was ordered to remain near Monterrey, while Polk reluctantly chose Winfield Scott to lead the attack on Veracruz. In March 1847, Polk learned that Taylor had ignored orders and had continued to march South, capturing the northern Mexican town of Saltillo. Taylor’s army repulsed a larger Mexican force, led by Santa Anna, in the Battle of Buena Vista. Meanwhile, Scott landed in Veracruz, and quickly won control of the city. With the capture of Veracruz, Polk dispatched Nicholas Trist, Buchanan’s chief clerk, to negotiate a peace treaty with Mexican leaders. Trist was ordered to seek the cession of Alta California, New Mexico, and Baja California, recognition of the Rio Grande as the southern border of Texas, and American access across the Isthmus of Tehuantepec. Trist was authorized to make a payment of up to $30 million in exchange for these concessions. In August 1847, Scott defeated Santa Anna at the Battle of Contreras and the Battle of Churubusco. With these victories over a larger force, Scott’s army was positioned to besiege Mexico’s capital. Santa Anna negotiated a truce with Scott, and the Mexican foreign minister notified Trist that they were ready to begin negotiations. However, the Mexican and American delegations remained far apart on terms; Mexico was only willing to yield portions of Upper California, and refused to agree to the Rio Grande border. While negotiations continued, Scott captured the Mexican capital in the Battle for Mexico City. In the United States, a heated political debate emerged regarding how much of Mexico the United States should seek to annex, with Whigs such as Henry Clay arguing that the United States should only seek to settle the Texas border question, and some expansionists arguing for the annexation of all of Mexico. Frustrated by the lack of progress in negotiations, and troubled by rumors that Trist was willing to negotiate on the Rio Grande border, Polk ordered Trist to return to Washington. Polk decided to occupy large portions of Mexico and wait for a Mexican peace offer. In late 1847, Polk learned of Scott and Trist’s attempt to bribe Mexican officials in an attempt to open negotiations, as well as Scott’s court-martial of a close Polk friend, Gideon Johnson Pillow. Outraged especially by the latter event, Polk demanded Scott’s return to Washington, with William Orlando Butler tapped as his replacement. In September 1847, Manuel de la Peña y Peña replaced Santa Anna as President of Mexico, and Pena and his Moderado allies showed a willingness to negotiate based on the terms Polk had relayed to Trist. In November 1847, Trist received Polk’s order to return to Washington. After a period of indecision, and with the backing of Scott and the Mexican government (which was aware of Trist’s recall), Trist decided to enter into negotiations with the Mexican government. As Polk had made no plans to send an envoy to replace him, Trist thought that he could not pass up the opportunity to end the war on favorable terms. Though Polk was outraged by Trist’s decision, he decided to allow Trist some time to negotiate a treaty. Throughout January 1848, Trist regularly met with Mexican officials in Guadalupe Hidalgo, a small town North of Mexico City. Trist was willing to allow Mexico to keep Lower California, but successfully haggled for the inclusion of the important harbor of San Diego in a cession of Upper California. The Mexican delegation agreed to recognize the Rio Grande border, while Trist agreed to have the United States cover prior American claims against the Mexican government. The two sides also agreed to the right of Mexicans in annexed territory to leave or become U.S. citizens, American responsibility to prevent cross-border Indian raids, protection of church property, and a $15 million payment to Mexico. On February 2, 1848, Trist and the Mexican delegation signed the Treaty of Guadalupe Hidalgo. Polk received the document on February 19. While he remained angry at Trist for disobeying orders, Polk and a majority of his Cabinet accepted the terms of the treaty. In dissent were Buchanan, who called for more territory, and Secretary of the Treasury Walker, who wanted to annex all of Mexico. Though Polk also expressed a desire for more territory, he was eager to bring the war to a close and reasonably satisfied with the amount of ceded territory, so he submitted the treaty to the Senate. Ratification of the treaty required a 2/3 super-majority of the Senate, and ratification was uncertain due to the opposition of various Senators, including those who opposed the annexation of any Mexican territory. On March 10, the Senate ratified the treaty in a 3814 vote, with aye and nay votes spread equally across partisan and geographic lines. The Senate made some modifications to the treaty before ratification, and Polk worried that the Mexican government would reject the modifications. However, on June 7, Polk learned that Mexico had ratified the treaty, thus ending the war. With the acquisition of California, Polk had accomplished all four of his major presidential goals. The Mexican Cession added 600,000 square miles of territory to the United States, including a long Pacific coastline. The modern states of California, Nevada, Utah, most of Arizona, and parts of New Mexico, Colorado, and Wyoming were all included in the Mexican Cession. The treaty also recognized the annexation of Texas and acknowledged American control over the disputed territory between the Nueces River and the Rio Grande. Mexico, in turn, received $15 million. The war had cost the lives of nearly 14,000 Americans and 25,000 Mexicans, as well as the expense of roughly one hundred million dollars. The 1853 Gadsden Purchase would later acquire another 30,000 square miles from Mexico (the area eventually became part of Arizona and New Mexico), establishing the modern borders of the Contiguous United States. Polk issued an official proclamation of the end of the war on July 4, 1848. Polk’s next task was the establishment of territorial governments in the new territories, which was complicated by the ongoing slavery debate. The Missouri Compromise had settled the issue of the geographic reach of slavery within the Louisiana Purchase territories by prohibiting slavery North of the 36°30? latitude, and Polk sought to extend this line into the newly acquired territory. Polk supported a territorial organization bill crafted by Senator John M. Clayton that would have prohibited slavery in Oregon while staying silent on the issue in California and New Mexico. Though the bill passed the Senate, it was defeated in the House in an effort led by Alexander H. Stephens of Georgia. A separate measure to extend the Missouri Compromise line to the Pacific coast was also defeated in the House, this time by a bipartisan alliance of northerners. As the last congressional session before the 1848 election came to a close, Polk signed the lone territorial bill passed by Congress, which established the Territory of Oregon and prohibited slavery in it. Polk feared that the failure to provide for an organized government in New Mexico and especially California could lead to independence for those remote regions. When Congress re-convened in December, he focused his efforts on granting immediate statehood to California, thereby avoiding the issue of the Wilmot Proviso. However, the divisive issue of slavery blocked any such legislation, and Polk left office fearing that the United States might lose the western territories acquired during his presidency. The Compromise of 1850 would later settle a number of outstanding issues from Polk’s presidency, including the admission of California as a state and the creation of New Mexico Territory and Utah Territory. Polk’s ambassador to the Republic of New Granada, Benjamin Alden Bidlack, negotiated the MallarinoBidlack Treaty with the government of New Granada. Though Bidlack had initially only sought to remove tariffs on American goods, Bidlack and New Granadan Foreign Minister Manuel María Mallarino negotiated a broader agreement that deepened military and trade ties between the two countries. The treaty also allowed for the construction of the Panama Railway. In an era of slow overland travel, the treaty gave the United States a route to more rapidly travel between its eastern and western coasts. In exchange, Bidlack agreed to have the United States guarantee New Granada’s sovereignty over the Isthmus of Panama. The treaty won ratification in both countries in 1848. The agreement helped to establish a stronger American influence in the region, as the Polk administration sought to ensure that Great Britain would not dominate Central America. The United States would use the Mallarino-Bidlack Treaty as justification for numerous military interventions in the 19th century. In mid-1848, President Polk authorized his ambassador to Spain, Romulus Mitchell Saunders, to negotiate the purchase of Cuba and offer Spain up to $100 million, an astounding sum at the time for one territory, equal to $2.77 billion in present-day terms. Cuba was close to the United States and had slavery, so the idea appealed to Southerners but was unwelcome in the North. However, Spain was still making huge profits in Cuba (notably in sugar, molasses, rum, and tobacco), and thus the Spanish government rejected Saunders’ overtures. Though Polk was eager to acquire Cuba, he refused to support the proposed filibuster expedition of Narciso López, who sought to invade and annex Cuba. In his inaugural address, Polk called upon Congress to re-establish the Independent Treasury System under which government funds were held in the Treasury and not in banks or other financial institutions. President Van Buren had previously established a similar system, but it had been abolished during the Tyler administration. After personally winning the support of Senator Dixon Lewis, the chairman of the Senate Finance Committee, Polk was able to push the Independent Treasury Act through Congress, signing it into law on August 6, 1846. The act provided that the public revenues were to be retained in the Treasury building and in sub-treasuries in various cities, separate from private or state banks, to receive all government funds. The system would remain in place until the passage of the Federal Reserve Act in 1913. Polk’s other major domestic initiative was the lowering of the tariff, as Polk argued that the tariff should only be as high as necessary for the operation of the federal government. 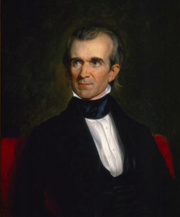 Though he had taken an ambivalent position on the tariff during the 1844 campaign in order to win Northern votes, Polk had long opposed a high tariff and viewed the protection of manufacturing interests as unfair to other economic activities. Polk directed Secretary of the Treasury Robert Walker to draft a new and lower tariff, which Polk submitted to Congress. After intense lobbying campaigns by both sides, the bill passed the House and, in a close vote that required Vice President Dallas to break a tie, the Senate. In 1846, Polk signed the Walker Tariff into law, substantially reducing the rates that had been set by the Whig-backed Tariff of 1842. The new law abandoned ad valorem tariffs and set rates independent of the monetary value of the product. Polk’s lowering of the tariff was popular in the South and West; however, it was despised by many protectionists in the Northeast, especially Pennsylvania. A reduction of tariffs in the United States and a repeal of the Corn Laws in Great Britain led to a boom in Anglo-American trade. Congress passed the Rivers and Harbors Bill in 1846 to provide $500,000 to improve rivers and harbors, but Polk vetoed the bill. It would have provided for federally funded internal improvements on small harbors. Polk believed that this was unconstitutional because the bill unfairly favored particular areas, including ports which had no foreign trade. Polk believed that these problems were local and not national. Polk feared that passing the Rivers and Harbors Bill would encourage legislators to compete for favors for their home districts  a type of corruption that would spell doom to the virtue of the republic. In this regard he followed his hero Andrew Jackson, who had vetoed the Maysville Road Bill in 1830 on similar grounds. Like Jackson, Polk saw slavery as a side issue compared to more important matters such as territorial expansion and economic policy. However, the issue of slavery became increasingly polarizing during the 1840s, and Polk’s expansionary policies increased its divisiveness. During his presidency, many abolitionists harshly criticized him as an instrument of the “Slave Power“, and claimed that spreading slavery was the reason he supported annexing Texas and later war with Mexico. The Wilmot Proviso, introduced by Democratic Representative David Wilmot of Pennsylvania on August 8, 1846 (just two months after the outbreak of the MexicanAmerican War), aimed to ban slavery anywhere in any territory that might be acquired from Mexico. Polk and many other Southerners were against the measure (which passed in the House, but not in the Senate). Polk argued instead for extending the Missouri Compromise line west to the Pacific Ocean. That would have allowed slavery below the 36° 30′ latitude line west of Missouri, and prohibit it above. Though Polk opposed the Wilmot Proviso, he also condemned southern agitation on the issue, and he accused both northern and southern leaders of attempting to use the slavery issue for political gain. Polk was a slaveholder for his entire life. His father, Samuel Polk, had left Polk more than 8,000 acres (32 km²) of land, and divided about 53 slaves to his widow and children after he died. James inherited twenty of his father’s slaves, either directly or from deceased brothers. In 1831, he became an absentee cotton planter, sending slaves to clear plantation land that his father had left him near Somerville, Tennessee. Four years later Polk sold his Somerville plantation and, together with his brother-in-law, bought 920 acres (3.7 km²) of land, a cotton plantation near Coffeeville, Mississippi. He ran this plantation for the rest of his life, eventually taking it over completely from his brother-in-law. Polk rarely sold slaves, although once he became President and could better afford it, he bought more. Polk’s will stipulated that their slaves were to be freed after his wife, Sarah, had died. However, the 1863 Emancipation Proclamation and the 1865 Thirteenth Amendment to the United States Constitution freed all remaining slaves in rebel states long before the death of his wife in 1891. On March 4, 2017, tombstones for two of his slaves, Elias Polk and Matilda Polk, were replaced in the Nashville City Cemetery. One of Polk’s last acts as President was to sign the bill creating the Department of the Interior (March 3, 1849). This was the first new cabinet position created since the early days of the Republic. Polk had misgivings about the federal government usurping power over public lands from the states; however, the delivery of the legislation on his last full day in office gave him no time to find constitutional grounds for a veto, or to draft a sufficient veto message, so Polk signed the bill. Honoring his pledge to serve only one term, Polk declined to seek re-election in 1848. However, Polk’s actions strongly affected the 1848 race. With Polk out of the race, the Democratic Party remained fractured along geographic lines, with Senators Cass and Calhoun the leading western and southern candidates, respectively. Former President Van Buren also retained strong support among northeasterners. Polk privately favored Cass as his successor, but resisted becoming closely involved in the election. At the 1848 Democratic National Convention, which lasted from May 22 to May 25, a message from Polk reiterated his absolute refusal to serve a second term. At the convention, Buchanan, Cass, and Supreme Court Justice Levi Woodbury emerged as the main contenders. Cass led after the first ballot, and slowly gained support until he clinched the nomination on the fourth ballot. William Butler, who had replaced Winfield Scott as the commanding general in Mexico City, won the vice presidential nomination. Cass’s nomination from many northerners and southerners, each of whom saw Cass as insufficiently committed to their position on the slavery issue. During the course of the Mexican War, Generals Taylor and Scott emerged as strong Whig candidates, alongside anti-war Senator Thomas Corwin and longtime party leader Henry Clay. As the war continued, Taylor’s stature with the public grew, and he announced in 1847 that he would not refuse the presidency. The 1848 Whig National Convention took place on June 8, with Taylor, Clay, Scott, and Massachusetts Senator Daniel Webster emerging as the major candidates. Taylor narrowly led Clay after the first ballot, but Taylor steadily grew his support until he captured the nomination on the fourth ballot. Clay bemoaned the selection of Taylor, as the ideologically ambiguous Taylor had not articulated his preferred policies. The Whigs chose former Congressman Millard Fillmore of New York as Taylor’s running mate. In New York, an anti-slavery Democratic faction known as the Barnburners strongly supported the Wilmot Proviso and rejected Cass. Joined by other anti-slavery Democrat from other states, the Barnburners held a convention nominating former President Martin Van Buren as their own presidential nominee. Though Van Buren had not been known for his anti-slavery views while president, he embraced them in 1848. Polk was surprised and disappointed by his former ally’s political conversion, and worried about the divisiveness of a sectional party organized around abolitionism. Van Buren was joined on the Free Soil Party‘s ticket by Charles Francis Adams Sr., son of former President and prominent Whig John Quincy Adams. Polk did not participate in the electoral campaign, as he believed doing so would be unpresidential; many members of his cabinet, however, did campaign for Van Buren. In the election, Taylor won 47.3% of the popular vote and a majority of the electoral vote, giving the Whigs control of the presidency. Cass won 42.5% of the vote, while Van Buren finished with 10.1% of the popular vote, more than any other third party presidential candidate at that time. Despite the increasingly polarizing slavery debate, Taylor and Cass both won a mix of northern and southern states. However, much of Van Buren’s support came from northern Democrats. Polk was very disappointed by the outcome as he had a low opinion of Taylor, seeing the general as someone with poor judgment and few opinions. Polk left Washington on March 6, 1849, never to return. 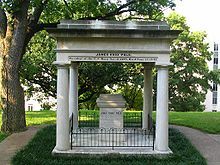 James K. Polk’s tomb lies on the grounds of the state capitol in Nashville, Tennessee. Polk’s time in the White House took its toll on his health. Full of enthusiasm and vigor when he entered office, Polk left on March 4, 1849, exhausted by his years of public service. He lost weight and had deep lines on his face and dark circles under his eyes. He is believed to have contracted cholera in New Orleans, Louisiana, on a goodwill tour of the South after leaving the White House. He died of cholera at his new home,Polk Place, in Nashville, Tennessee, at 3:15 pm on June 15, 1849, three months after leaving office. He had never joined any church, but received a deathbed Methodist baptism. Initially buried in what is now Nashville City Cemetery, due to a legal requirement related to his infectious disease death, he was moved to a tomb on the grounds of Polk Place (as specified in his will) less than a year later. Polk’s last words illustrate his devotion to his wife: “I love you, Sarah. For all eternity, I love you.” She lived at Polk Place for 42 years after his death and died on August 14, 1891. His mother, Jane Knox Polk, died on January 11, 1852. In 1893, the bodies of President and Mrs. Polk were exhumed and relocated to their current resting place on the grounds of the Tennessee State Capitol in Nashville. Polk Place was demolished in 1900. In 2017, state legislative action was considered to relocate the Polk’s remains to his father’s home in Columbia, Tennessee. Polk had the shortest retirement of all Presidents at 103 days. He was the youngest former president to die in retirement at the age of 53 (only James A. Garfield and John F. Kennedy, who were both assassinated in office, died at a younger age). Along with George Washington, Andrew Johnson, Chester A. Arthur, Calvin Coolidge and Lyndon B. Johnson, he is one of six presidents to have died while his direct successor was in office. Polk’s historic reputation was largely formed by the attacks made on him in his own time. Whig politicians claimed that he was drawn from a well-deserved obscurity. Sam Houston is said to have observed that Polk was “a victim of the use of water as a beverage”. Senator Tom Corwin of Ohio remarked “James K. Polk, of Tennessee? After that, who is safe?” The Republican historians of the nineteenth century inherited this view. Polk was a compromise between the Democrats of the North, like David Wilmot and Silas Wright, and Southern plantation owners led by John C. Calhoun. The Northern Democrats thought that when they did not get their way, it was because he was the tool of the slaveholders, and the conservatives of the South insisted that he was the tool of the Northern Democrats. These views were long reflected in the historical literature, until Arthur M. Schlesinger Jr. and Bernard De Voto argued that Polk was nobody’s tool, but set his own goals and achieved them. Polk is now recognized, not only as the strongest president between Andrew Jackson and Abraham Lincoln, but also the president who made the United States a coast-to-coast nation. When historians began ranking the presidents in 1948, Polk ranked 10th in Arthur M. Schlesinger‘s poll. and has subsequently ranked 8th in Schlesinger’s 1962 poll, 11th in the Riders-McIver Poll (1996), 11th in the most recent Siena Poll (2002), 9th in the most recent Wall Street Journal Poll (2005), and 12th in the latest C-Span Poll (2009). He is usually among the highest-ranking one-term presidents. While Polk’s legacy thus takes many forms, the most outstanding is the map of the continental United States, whose landmass he increased by a third. “To look at that map,” Robert W. Merry concluded, “and to take in the western and southwestern expanse included in it, is to see the magnitude of Polk’s presidential accomplishments.” Though there were powerful forces compelling Americans to the Pacific Ocean, some historians, such as Gary Kornblith, have posited that a Clay presidency would have seen the permanent independence of Texas and California. Nevertheless, Polk’s aggressive expansionism has been criticized on ethical grounds. He believed in “Manifest Destiny” even more than most did. Referencing the MexicanAmerican War, General Ulysses S. Grant stated that “I was bitterly opposed to the , and to this day regard the war, which resulted, as one of the most unjust ever waged by a stronger against a weaker nation. It was an instance of a republic following the bad example of European monarchies, in not considering justice in their desire to acquire additional territory.” Whig politicians, including Abraham Lincoln and John Quincy Adams, contended that the Texas Annexation and the Mexican Cession enhanced the pro-slavery factions of the United States. Disputes pertaining to the status of slavery in the territories acquired during the Polk administration led to the Compromise of 1850, one of the primary factors in the establishment of the Republican Party and later the beginning of the American Civil War.